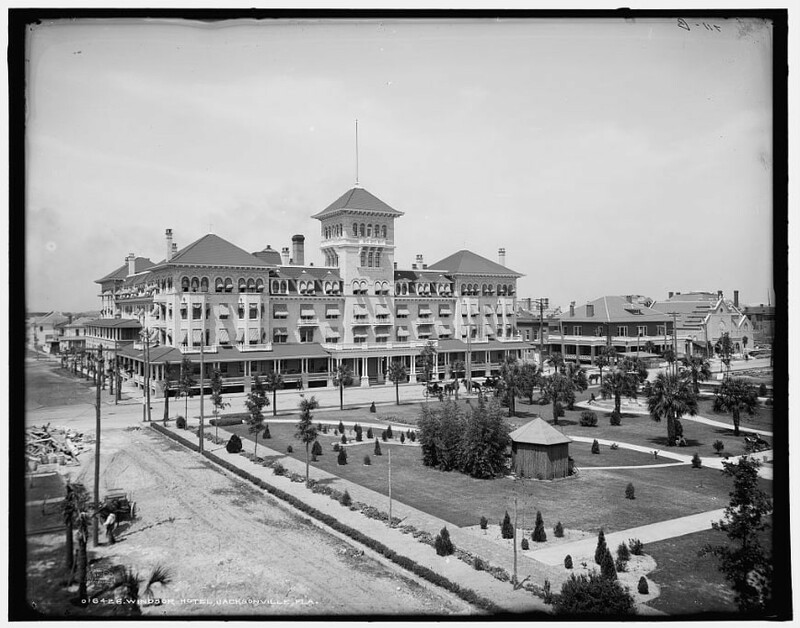 The historic Windsor Hotel in Jacksonville, Florida around 1903. Originally built in 1875, the hotel burnt down in a 1901 fire that consumed much of the city's downtown. It was rebuilt and added to throughout the years, but eventually demolished in 1950. Clyde Emerson (1890-1919) worked at this hotel prior to World War I, during his time traveling the state looking for work in the hospitality industry. Leaving the United States for Europe on July 31, 1918, Emerson and his unit participated in many of the last major campaigns of World War I, inlcuding the Meuse-Argonne Offensive. This was the allied offensive that ended the war. Emerson survived the war and remained in Europe awaiting demobilization. During this time, Emerson contracted Spanish influenza, which would claim the lives of more soldiers and civilians than the war, and died on January 30, 1919. He was originally buried two days later in Aix-les-Bains, Savoie, France. However, he was later reinterred in December 22, 1922 at the Aisne-Marne American Cemetery in Belleau, France. Grave 8, Plot 11, Block B is his final resting place. Digital reproduction of original black and white still negative: Library of Congress Prints and Photographs Division, LCCN 2016803215. Originally created and published by the Detroit Publishing Company. American Battle Monuments Commission. 81st Division, Summary of Operations in the World War. Washington, D.C., United States Printing Office, 1944. Call Box. "Call Box: The Hotel Windsor's Reign Across from Hemming Park Ended in 1950." Jacksonville.com, April 17, 2016. Accessed September 18, 2018. http://www.jacksonville.com/reason/call-box/2016-04-17/story/call-box-hotel-windsors-reign-across-hemming-park-ended-1950. Florida Department of Military Affairs. "Clyde A Emerson." Online database with images, FloridaMemory. Ocala, Florida. Army Box 5. Accessed Setptember 14, 2018. https://www.floridamemory.com/items/show/214874. Keene, Jennifer D. World War I: The American Soldier Experience. Lincoln, NE: University of Nebraska Press, 2011. The Ocala Evening Star, "Ocala House Improvements." March 14, 1914. From Newspapers.com. https://www.newspapers.com/image/339362997/?terms=Ocala%2BHouse%2BImprovements/. War Department, Office of the Quartermaster General, Grave Registration Service. "Card Register of Burials of Deceased American Soldiers, 1917-1922." Record Group 92: Records of the Office of the Quartermaster General, 1774-1985. Online database, National Archives and Records Administration. Entry Number NM-81 1945. Accessed September 14, 2018. https://catalog.archives.gov/id/6943087. Detroit Publishing Company. 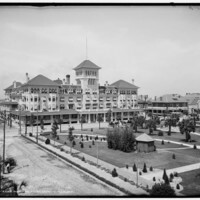 “Windsor Hotel, Jacksonville, Florida, 1903.” RICHES of Central Florida accessed April 19, 2019, https://richesmi.cah.ucf.edu/omeka/items/show/10368.